Acting Balanced: THirsty for Comments! It's time to link up a great post and share! 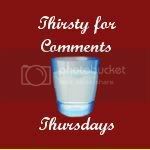 THirsty for Comments! It's time to link up a great post and share!